In the case of the princely courts of the Renaissance, commissions promoted not simply the ruler but the prestige of the city. Patronage was a tool of rulership and diplomacy. In 1959, noted art historian Bernard Berenson likened the Renaissance relationship between artist and patron to one between a carpenter, tailor, or shoemaker and a customer placing an order. The patron specified what he or she wanted: what the subject was, which figures were to be included, often what other works the new work might resemble or surpass. In the fourteenth and early fifteenth centuries, it was common even to specify what materials (e.g., gold leaf and the expensive ultramarine pigment made of lapis lazuli) should be used and in what amounts. Today, most scholars argue for a more active, more creative role on the part of artists. While many of the princely patrons we will encounter here were outsized personalities who exerted great control over their artistic projects, the growing status of artists also brought a new dynamic to patronage relationships. Artists were no longer nearly anonymous craftsmen; now, their creativity was valued as unique, individual, and driven by genius. The prestige of an artist’s reputation began to outweigh not only the value of precious materials but the patron’s own desire to have a certain “story” told. Would you dream of owning “a Monet”? Would it matter if the scene was in Argenteuil or Giverny, or if it included this or that motif? This kind of desire to own a work, any work, by a famous artist arose in the years we consider in this essay. 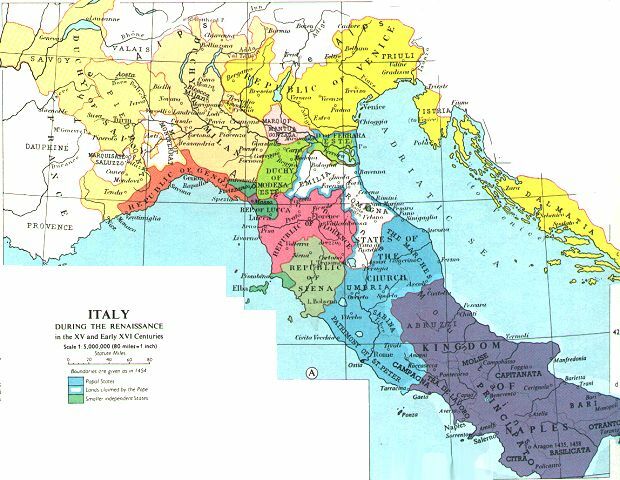 Renaissance Italy was a shifting mosaic of states (see map of Italy in the 15th century); it did not become a unified political entity until the nineteenth century. In the period we examine here, most of the peninsula was governed by autocratic rulers. 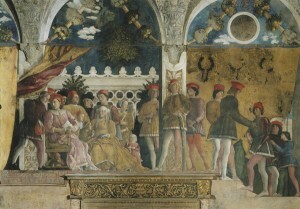 Five princely courts stand out for their patronage of the arts and humanities: Milan under the Sforza family, Urbino under the Montefeltro, Naples under the Aragonese, Mantua under the Gonzaga, and Ferrara under the Este. We use the term “princely” to describe the rulers and their courts, but their titles were mostly those of duke or marquis. Only Naples had a king. The sizes of these states and the cities that anchored them varied widely. Milan and Naples were among the largest cities in Europe, while the others were quite small. In 1500, Mantua had a population of only about 25,000. In principle, at least, the cities’ ruling families were vassals: of the Holy Roman Emperor in Milan and Mantua, of the pope in Urbino, Naples, and Ferrara. In practice, however, the families exerted nearly absolute control within their dominions. They had very close ties through marriage (see Wedding Pictures). Ludovico Sforza, the duke of Milan, for example, was the son-in-law of Ercole d’Este and Eleanora of Aragon, rulers in Ferrara. Eleanora was the daughter of the king of Naples, and another one of her daughters, Isabella d’Este, was married to Francesco Gonzaga of Mantua. Isabella’s sister-in-law, meanwhile, was the wife of the duke of Urbino. (For help in sorting out these complex lineages, see More Resources). The culture of the courts was a mixture of old and new, combining medieval chivalry and Renaissance humanism. The Este claimed to trace their ancestry back to the legendary knights of King Arthur’s Round Table. They had ruled as lords of Ferrara since the mid-thirteenth century. The Montefeltro family had been overlords of Urbino since 1267, and the Gonzaga of Mantua since 1328. All these families maintained close relations with counterparts in northern Europe, especially with the rich court of the dukes of Burgundy; the Italian families’ sons were often sent there to be trained in the arts of war and the mannered elegance of courtly demeanor. 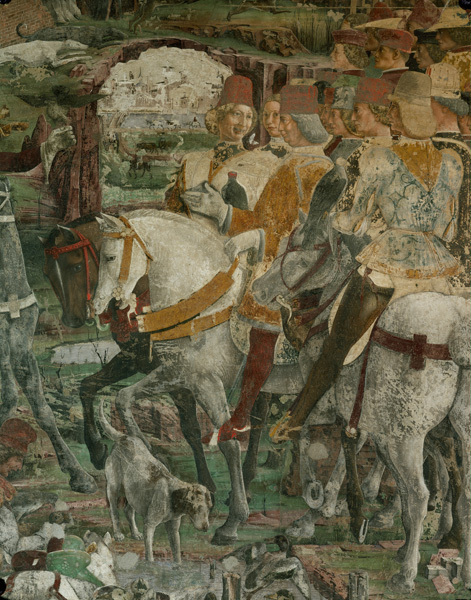 Many rulers offered their expertise in war to other states by working as condottieri. It was a celebrated condottiere in the employ of Naples who first assumed the name Sforza (force) and whose heirs became dukes in Milan. Military service was a vital source of income and a vehicle for influence. Not surprisingly, the condottieri’s courts had a strong martial cast. Jousts, hunting, and falconry were pursuits closely aligned with chivalric ideals and aristocratic prerogative. These cities, however, were also dedicated centers of the new Renaissance culture of learning (see New World of Learning). Courts competed for the service of noted scholars, and both sons and daughters were given a broad education in what we would today call the humanities. In Milan and Naples, humanists were employed to promote the legitimacy of relatively newer regimes through histories and biographies; artists did the same with powerful visual symbols of wealth and authority. The older families in Urbino, Mantua, and Ferrara used humanism and the arts to enhance the prestige of their much smaller courts. This was one field on which they could equal or surpass larger and more powerful states. Of all Renaissance princes, none was more devoted to refinement and luxury than Borso d’Este; he was particularly renowned among contemporaries for his rich clothing. This scene is a small portion of an entire room of frescoes dedicated to the labors and delights of the months, a thematic series frequently seen in illuminated books of hours. 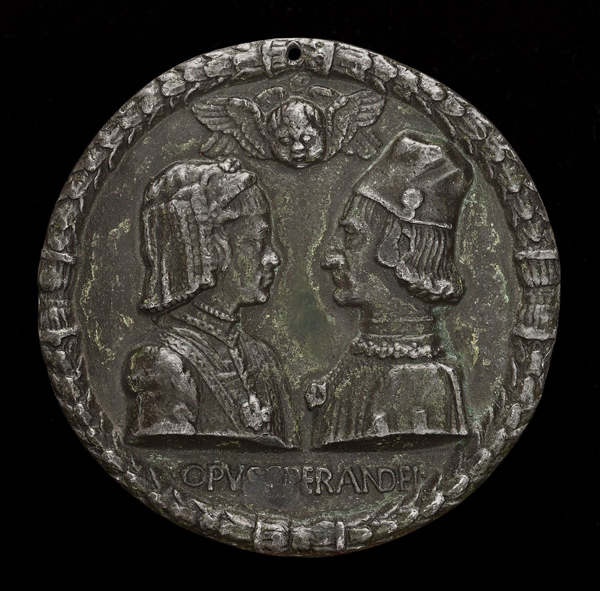 In Ferrara, the pleasures and courtly pastimes included not only hunting and chivalrous contests but also the flirtations of young couples in spring. Witty allusions and erudite references to mythological and zodiacal figures abound. The painter, Francesco del Cossa, was paid for his work by the square foot and complained bitterly about his low compensation. He petitioned Borso for more but was denied. It has been suggested that perhaps the low payment was due not to the patron’s lack of generosity but the possibility that Ferrara’s court artist Cosmè Tura had supplied the designs. 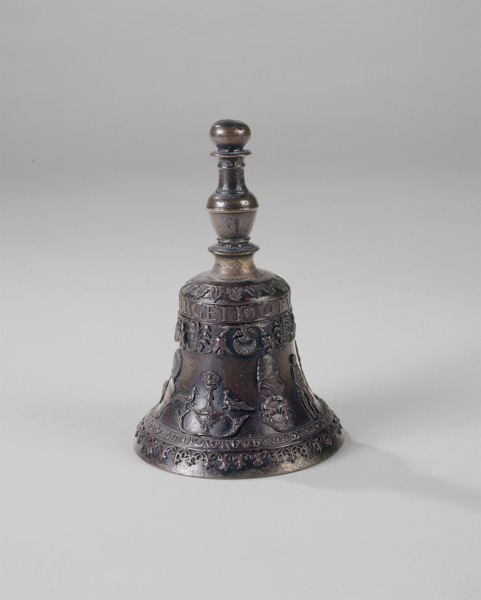 Ruling families were expected to direct and fund large-scale religious and civic projects, and their palaces had to be adequately sumptuous, especially in the reception and banqueting spaces that were settings for the families’ public roles. The audience for most of this display was not the subjects of the ruling families, but important guests. Lavish entertaining was a currency of respect and a noted tool of diplomacy, even if it required some sacrifice. In 1459, for example, Ludovico Gonzaga hosted Pius II, who was in Mantua to promote a new crusade against the Turks. While the large papal entourage spent eight or nine months in great luxury, Ludovico and his family made do in quarters that were undergoing renovations. When Eleanora of Aragon traveled to her wedding celebration in Ferrara, she was feted at great expense in each city she visited along the way; at a single dinner, she and her large retinue were served fifty-six different dishes. Court artists were called to support this display in many ways. They produced designs for buildings, grand squares, and major decorations; made paintings and sculpture, especially portraits; and also created household goods and luxury items for the table. They oversaw the costumes, banners, and temporary structures for the triumphal entry of important visitors, even the orchestration of dance and musical performances into exciting visual tableaux. The job of a Renaissance court artist was not in small measure that of impresario. This panel, once part of a wedding chest, was perhaps modeled on a set of theater decorations that Mantegna created, presumably for Francesco Gonzaga. A letter from the artist indicates that the scenes, which are based on Petrarch’s I Trionfi, were set around the stage parapet and illuminated by “richly lit candelabra.” The chariot’s elaborate flaming tower may be a reference to them. Humanist Giovanni Pontano (1446–1503) was one of the finest Latin poets of the Renaissance and an adviser to the kings of Naples on military and political matters. He also wrote a treatise entitled On Splendor, in which he argued that the spending of large sums on precious objects was an expression of a ruler’s merit or virtue (virtù). The notion of virtue runs through Renaissance commentary about the nature of princes and princely patronage. Following ideas first elaborated by Aristotle, Renaissance theorists regarded “magnificence” as an obligation of position and wealth. Its measure was not simply one of opulence but of appropriateness and, especially, benefit to the community. The wise use of riches, magnificence entailed lavish display and grand gesture but also generosity, decorum, and charity. A family’s and a state’s reputation was enhanced by donations of tangible benefit—and by beauty. Magnificence was served by art. A consideration of patronage obviously introduces questions about money. 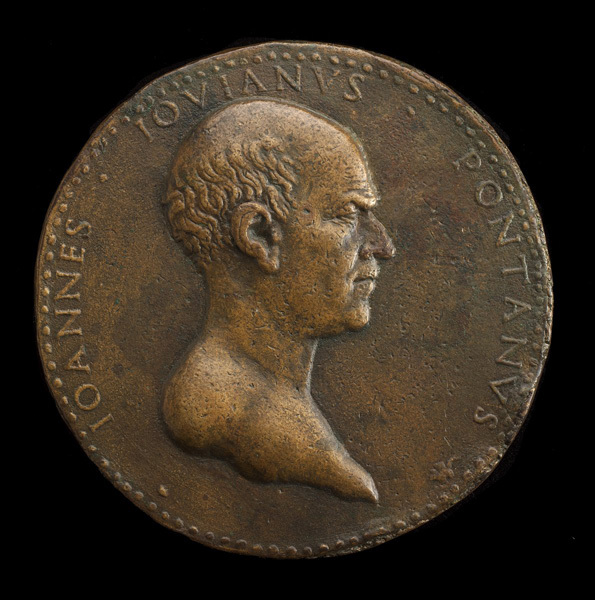 Many of the richest Renaissance states in Italy maintained their own systems of weights and measures and issued their own coinages, which were circulated internationally. Two of the most widely trusted currencies were the Florentine florin and the Venetian ducat, each containing about 3.5 grams of gold. 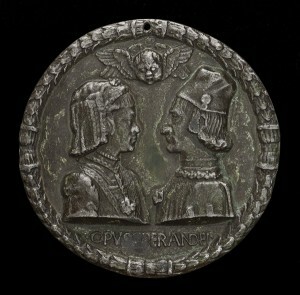 The Venetian ducat was minted continuously from 1284 until the end of the Venetian republic in the late eighteenth century. Calculating modern equivalences is very difficult and gold prices fluctuate; it may be easier to keep in mind a few “price points” for comparison. In 1500, a pilgrim traveling in relative comfort from Italy to the Holy Land would expect to pay about 150 ducats for the months-long journey. Annual wages of the typical mathematics tutor were 100 ducats, about the same as those of a skilled craftsman, while a hired foot soldier could expect only 15 ducats for a year’s service. The king of Naples, whose yearly income was estimated at more than 800,000 ducats, paid a salary of 500 ducats to his court historian and 400 to his chief advisor for defense, but only 144 to the architect who designed the main reception rooms in the palace. His head cowherd received 24 ducats. The family palace of a wealthy Florentine merchant might cost about 40,000 florins. The relative value assigned to different arts was not the same during the fifteenth and early sixteenth centuries as it is today. Tapestries and richly illuminated manuscripts were considered much more desirable than painting or sculpture, especially in aristocratic circles. In places with a strong humanist tradition, antiquities and natural rarities were even more highly valued. 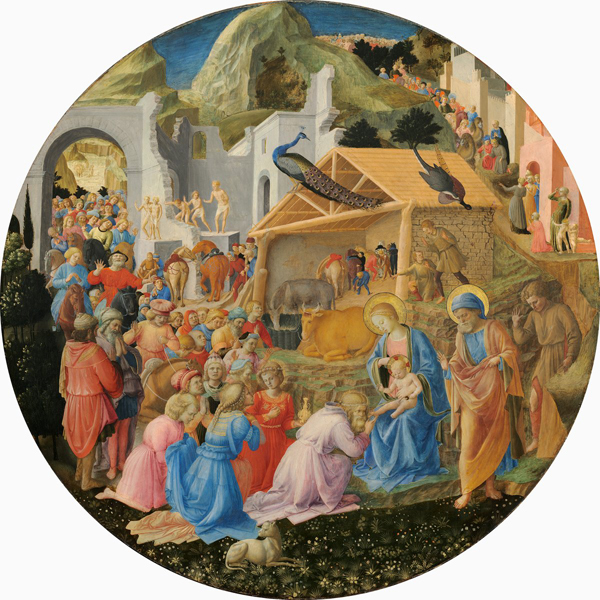 The inventory made after the death of Lorenzo de’ Medici in 1492, for example, assigned a painting of the Adoration of the Magi, almost certainly this large tondo by Fra Angelico and Fra Filippo Lippi, a value many times less than a single antique cameo—or a unicorn horn. In Florence a life-size bronze statue commanded about 1,000 florins, roughly five times that of a marble sculpture of the same size. A painted panel in a carved and gilded frame probably cost about 200 florins, a large frescoed scene as little as 25. Apparently begun by Fra Angelico and completed by Filippo Lippi, this brilliantly colored panel shows evidence of both artists’ styles: compare Fra Angelico’s gentle Madonna, for example, with Filippo’s more robust Joseph. Epiphany, marking the Magi’s discovery of the Christ Child, was an occasion for lavish pageantry in Florence. The processions were sponsored by the Compagnia dei Magi, one of the city’s leading confraternities and one strongly supported by the Medici family.